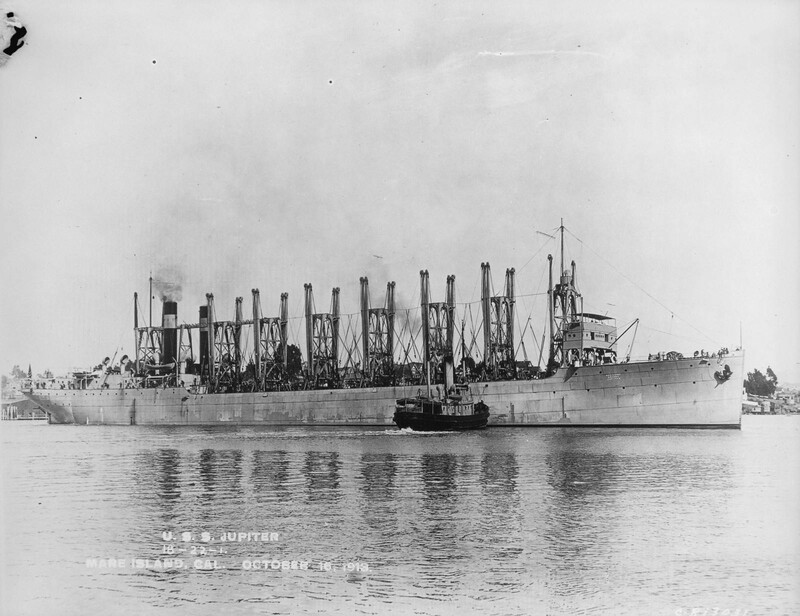 Photo of the US Navy collier ‘USS Jupiter’ taken on 16 Oct 1913. After an extensive rework in 1922 the USS Jupiter become the USS Langley (CV1) – the United States’ first aircraft carrier. The first aircraft carrier designed as such was not laid down until two years later. This next photo taken on October 16th is one I’ve debated long and hard with myself over posting. This is the corpse of Wilheim Keitel, Hitler’s notorious ‘yes man’ and the person responsible for signing off on several murderous decrees. The photo was taken by the US Army shortly after his execution on this day. After he was denied a request to be shot by firing squad and his resulting death by hanging took a full 24 minutes. He can be seen in rather more rude health standing beside Hitler in one of yesterday’s ‘On This Day’ photos. David, it’s history, my friend. Most of us have seen worse. It’s a great reminder of what tyrants deserve … and sometimes get. And the picture of the collier, USS Jupiter is very interesting. ESPECIALLY when one considers what that ship became! I feel the same way, Jeff. Part of me thinks 24 minutes was not long enough for him to suffer. These men were truly monsters. Surprised you got this through. I posted something in an old ‘Friday Briefing’ that had corpses in the background (I hadn’t noticed.) and was asked to take it down. I think it has to do with history as a touchstone/inspiration for modelling projects as opposed to conflicts depicted at the most visceral level. I thought this post may run up against problems and I was quite prepared to debate its relevance before taking it down. For me the fact that it happened on this day in time connects us closer to history. This man/monster was killed by ‘our side’ with very good reason and his death was long and horrible (some may say not enough), but let’s not just see it as a photo. It’s something that happened and his rise and actions should be considered. We may balk about seeing a dead body, in which case we shouldn’t be putting swastikas on planes. Agreed. Wonder why all the facial wounds if death was by hanging? I don’t recall getting an opportunity to debate anything, just told it had to go. Just to add, I think the editorial stance was/is that iM is a ‘family friendly’ 8-80 site, and focuses on the links between historical events and scale modelling, and any extension of that could be problematic as it drifts into other areas of historical research. I considered doing a ‘on this day’ series a couple of years ago, but quickly found that I was restricted by subject matter suitable to the site (having had my knuckles rapped earlier), so didn’t pursue the issue. Anyway, see how you go. I think any platform allowing the full display of the Hakenkreuz has already made an adult (and I think, correct) tacit decision on its members being able to discern between an image and it’s potentially divisive historical context. No moderator feedback as yet. And no Gremlin iModelers (I know there’s a few out there, self included…) at the door with torches and pitchforks. At least one of my reasons for sharing the image of Keitel’s body body is to give pause for thought, to look at the photo of him I posted yesterday when he stood by Hitler at von Trotha’s funeral and reflect on the nature of warfare, a subject central to almost all modelers’ hearts. I’m happy to edit the post if needs be – it’d be a small price to pay for the net gain of being part of this rabble of brothers. Craig, by witness accounts the trapdoor was very tight and resulted in many head/face injuries to the condemned caused by hitting the door frame on the drop. To this day there is debate over why the Nazis hanged that day had insufficient force to snap their necks, resulting in prolonged death struggles. It’s the consequences of ones actions and this is the result of those actions against humanity. The ultimate price you pay when you partake in events that cause extreme death and destruction. And for those who cause such horrific pain to others will always suffer the same. Such is good over evil in the end. Those may say that a little suffering at the end of the rope may have been a little payback to feel the pain instead of instant death such as a firing squad. You don’t get to pick the method of execution though it will never make up to those who lost their lives, friends and family due to this mans direct involvement. A man like this is hard to forgive, which makes it difficult for most of us who would like to despite what he has done, but in the end it was the correct thing to do. Justice is served. Forgiveness is an elusive quality at times and is often difficult to accept. All things being equal there’s a case to be hoped for that the real justice started after that 24 minutes at the end of a rope, Chuck. His soul will be tormented till the end of time as we know it. That is true justice served. I for one have no problem with images like this, this murderer got some of what he deserved so good riddance I say, I hope he felt every second . That said if the editor says it has to come down then I’m sure you will abide by that with good grace. This is an excellent series of postings and I have been enjoying them immensely. I thank you for taking the time (along with Rob and his usual “No Comment” postings that took the place of his Friday Briefings)……. Pictures like this don’t bother me in the least. In fact it should be presented as a reminder that evil things have happened in our past. There’s a saying “if you don’t remember the past, you are condemned to repeat it”. This may help keep us from repeating what happened before. When I was in Germany I visited Dachau. Enough said. He only got part of what he deserved during his last 24 minutes. There’s a little thing called Karma. You reap what you sow. Good for you David. More power to you. This should be a lesson for those who contemplate evil doings. I liked the picture of the Langley in its previous incarnation too. Thanks again my friend. Thanks, Louis. It’s an interesting thing that most of us modelers build military subjects, and something my wife, especially, finds hard to understand. She really responds positively when I have any non-war related project on the bench. And I can understand that. I guess as kids we grew up in generations that had direct connections with global conflict and we have just kept that fascination going through the models. Thanks for the support of the posts, I also loved the Langley photo! The guy was an evil pig. Anyway…….Isn’t it about time a new carrier be named Langley? There was CVL 27 after CV-1. Navsource is a good reference. Navsource is a stupenous source of data, Robert. Couldn’t have done my Enterprise build without it. There ought to always be a ‘Langley’ sailing, no? Aye! and an Ark Royal.